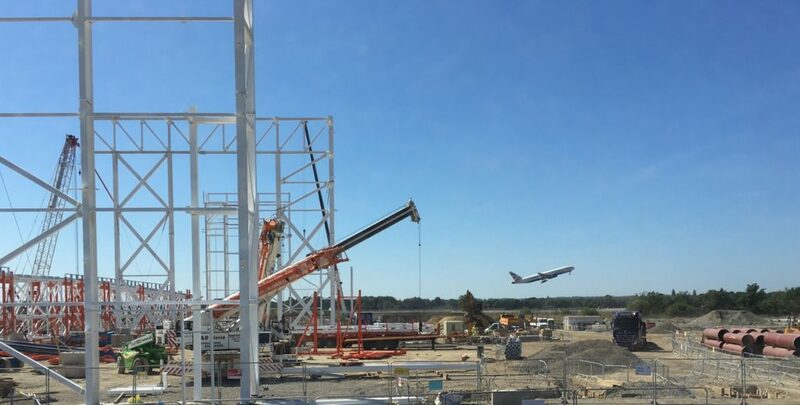 TCB were pleased to support J&D Pierce Contracts on site in the North West development zone of Gatwick airport with TCB installation training. The Goldcare hangar has 3,200 tonnes of steel bolted with over 30,000 M24 Greenkote® TCBs a short distance from the busy runway. The ‘Goldcare’ hangar has been designed on a huge scale to house the new 777X, which will be the largest aircraft in the Boeing fleet. The Boeing 777X is a new series of aircraft in the Boeing family. Carrying 450 passengers, featuring new engines and new composite wings with folding wingtips. The new hangar will accommodate two 777X’s at the same time. The erection of this hangar has proceeded at a rapid pace facilitated by a highly experienced J&D Pierce crew and the speed of TCB installation. J&D Pierce are leaders in structural steel fabrication and erection contractor in the UK . For almost 40 years they have developed a reputation for innovation in structural steelwork delivery from design to fabrication and construction. The professional team included Mott MacDonald’s aviation consultants with Main Contractors John Sisk. Previous PostPrevious JAM yesterday, JAM today & JAM tomorrow!